Last year, I wrote about the description of three new insect orders from the ever-voluminous amber deposits of Burma's Hukawng Valley. One of these was the monotypic Alienoptera (Bai et al., 2016), established for a single "roachoid" specimen notable for its saddle-shaped pronotum and shortened, earwig-like tegmina. ("Roachoid" here refers to any stem-group member of the clade Dictyoptera, the extant members of which are the mantises and cockroaches, the latter including the social cockroaches known as termites.) The elevation of this oddment to its own order was justified by it being recovered as sister to mantises (Mantodea) in a maximum parsimony analysis* that included 26 taxa and was inferred from 58 morphological characters, yielding only three most parsimonious trees. I argued that as Alienopterus brachyelytrus was recovered as sister to the Mantodea, its separation as an order (rather than a stem-group mantis) is entirely arbitrary. This question aside, it has since become apparent that the clade was a diverse one. The genera Alienopterella (Kočarek, 2018a) and Caputoraptor (Bai et al., 2018) were both described from burmite, the latter's kinship with Alienopterus supported by addition to the matrix of Bai et al. (2016) and maximum parsimony (Bai et al., 2018). Caputoraptor is noteworthy for its unique cephalo-thoracic "scissor apparatus". This unparalleled modification of the genae and pronotum consists of serrate margins on these respective surfaces that clearly function in opposition. We can only speculate on its function, and in the case of Caputoraptor are rather stumped: a grasping copulatory function (in females) was proposed; by analogy to the intersegmental "gin traps" of certain beetle pupae, defense is another functional possibility for the scissor apparatus; nor is a predatory function off the proverbial table (Bai et al., 2018). The description of both sexes of Caputoraptor with similar scissor apparatuses weighs against the idea of these having been copulatory in nature (Bai et al., 2018; Kočarek, 2018b), but we will likely never know for certain. Description of further taxa reveals that the Alienoptera were far more diverse and long-lived than anyone suspected, as they are now known from the Early Cretaceous of Brazil's Crato Formation to the mid-Paleogene Green River Formation of Wyoming (Vršansky et al., 2018), making them survivors of the infamous K-Pg mass extinction. 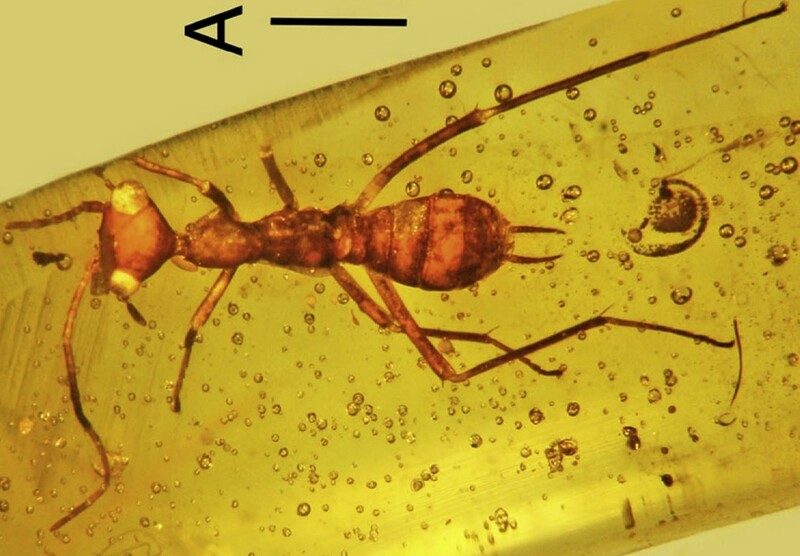 The expansion of the clade's known phenotypic range has led to the argument that the monotypic order Aethiocarenodea (Poinar & Brown, 2017) is in fact a nymph assignable to this group: in the context of triangle-headed Teyia branislav and myrmecomorphic Grant viridifluvius†, Aethiocarenus burmanicus' hypognathy‡ and ant-like habitus are no longer so unprecedented (Vršansky et al., 2018). Indeed, Vršansky et al. 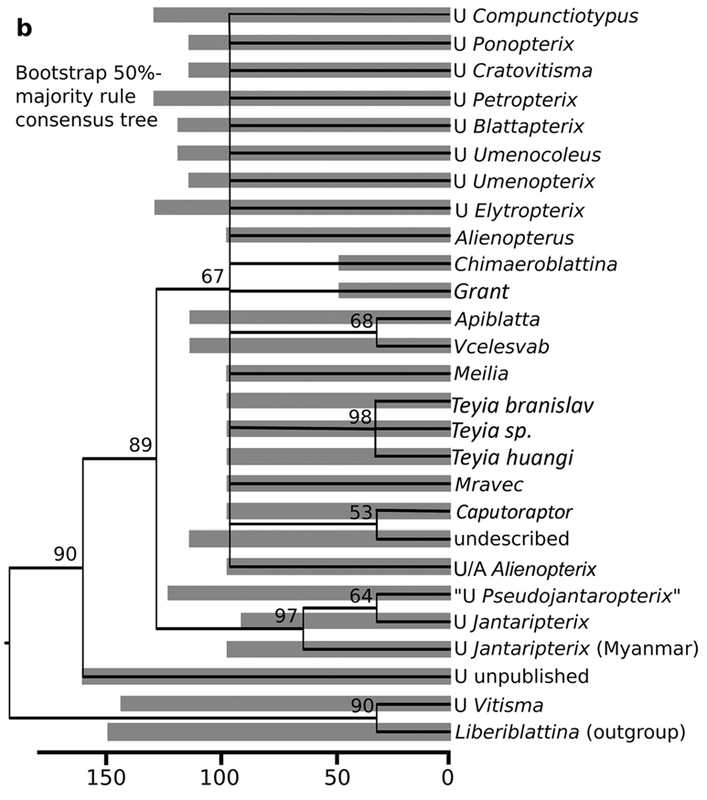 (2018) claim that the Alienopteridae (further information on the clade's taxonomic treatment by these authors below) were involved in a Batesian mimicry complex with the Aculeata: Grant, Teyia and Aethiocarenus being ant mimics of variable fidelity; the stocky and brightly colored Meilia a possible bee mimic; and Chimaeroblattina perhaps making pretenses of being a scoliid or angarosphecid wasp. A bold claim from Vršansky et al. (2018), as it would be only the second allegation of Batesian mimicry entirely based upon paleontological evidence (Topper et al., 2015) and so a rather untestable one. Still, the idea (and Ae. burmanicus' revised classification) is plausible. Rather more questionable are the methods Vršansky et al. (2018) used to infer the phylogenetic position of Al. brachyelytrus and kin, from which they concluded that these roachoids are in fact members of the Blattaria (true cockroaches and termites; Inward et al., 2007; Legendre et al., 2015). Rather than try to test the conclusions of Bai et al. (2016, 2018) by utilizing the character matrix of Bai et al. (2016), their dataset consisted of all known alienopterids excepting Alienopterella, an undescribed alienopterid from the Crato Formation, and Ae. burmanicus; several taxa belonging to the Mesozoic dictyopteran superfamily Umenocoleoidea, a taxon that is minus Umenocoleus equivalent to the Cratovitismoidea of Nel et al. (2014); and one other dictyopteran outgroup. 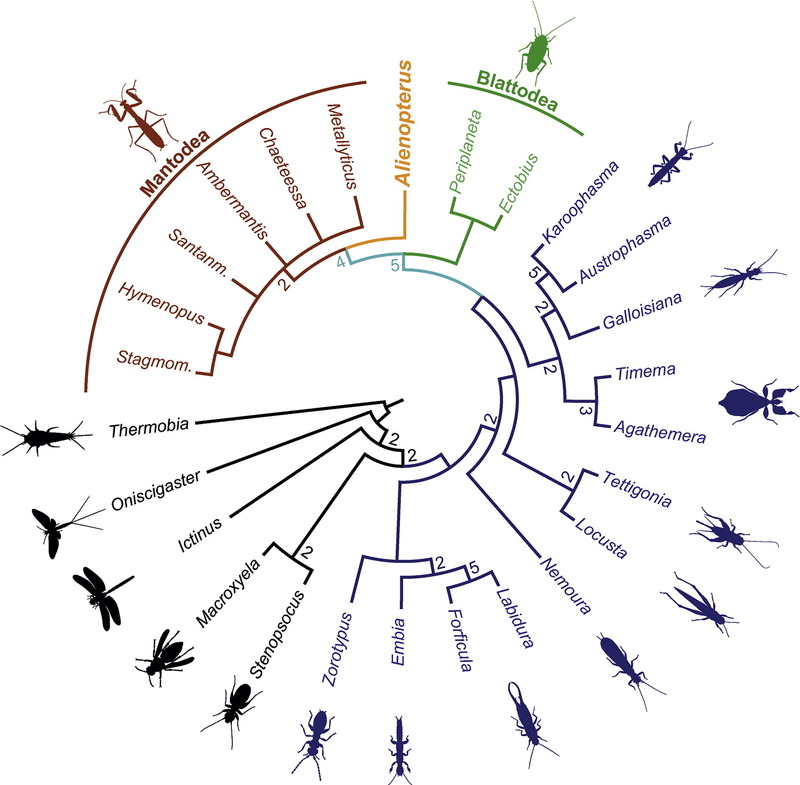 Outgroups from other insect clades (as in Bai et al. [2016, 2018]) are conspicuously absent. As the sampling of Vršansky et al. (2018) overlaps little with previous phylogenies, no comparisons can be drawn with the studies of Bai et al. (2016, 2017), which attenuates the replicability of any conclusions drawn from these data. Thirty-two equally most parsimonious trees were recovered (Vršansky et al., 2018). Support values for nodes were obtained by bootstrapping§ in conjunction with maximum parsimony analysis, which recovered a clade excluding the sole included non-umenocoleoid and the umenocoleoid (Bechly, 2007; Lee, 2016) Vitisma with 90% bootstrap support§ (Vršansky et al. 2018). There is little bootstrap support for any other clade within the dataset of Vršansky et al. (2018), leaving their tree mostly a shrub-like polytomy||. While polytomies express phylogenetic uncertainty in and of themselves, Vršansky et al. (2018) felt that it was also necessary to perform a network analysis, the mesh-like product of which demonstrated that, guess what, the data are unclear (Huson, 1998). With this tree supported to their satisfaction, Vršansky et al. (2018) propose sinking the Alienoptera to familial level within their conception of Umenocoleoidea, with Aethiocarenidae a junior synonym of the Alienopteridae. Since the Umenocoleoidea have been "proven to possess standard cockroach morphology" (Vršansky et al., 2018), they are assigned to the order Blattaria. No revised definition of the Blattaria including Alienopteridae is provided. Vršansky et al. (2018) excuse this by asserting that, first, "orders are not truly formalized units" (perhaps alluding to the fact that these are not under the purview of the International Code of Zoological Nomenclature); and second, that alienopterids' cockroach identity is axiomatic given their position within the Umenocoleoidea, making synonymization superfluous. But without an explicit cladistic or morphological definition of the Blattaria (I use that term here in the sense including termites) including the Alienopteridae, it is difficult to see how these systematic revisions contradict Bai et al. (2016, 2018), who (as a reminder) concluded that Al. 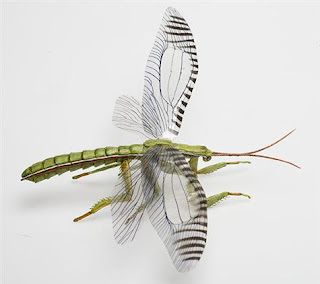 brachyelytrus was sister to the Mantodea, which are well-supported as sister to the remaining extant Dictyoptera (Klass & Meier, 2006; Legendre et al., 2015). In order for the phylogenetic conclusions of Bai et al. (2016, 2018) to be falsified, Umenocoleoidea including Alienopteridae would need to be closer to crown-group Blattaria than to the Mantodea. But this is not a hypothesis that Vršansky et al. (2018) test, nor do they test any other hypotheses regarding which roachoids are sister to mantises—which is a controversial matter, with particular debate surrounding an unfortunate taxon called the Anthracoptilidae (Guan et al., 2016). In the end, there is nothing resembling consensus on the phylogenetic relationship of the Umenocoleoidea to extant Dictyoptera, or indeed the phylogeny of fossil Dictyoptera in general; and by granting the question of phylogeny only superficial coverage, Vršansky et al. (2018) fail to convince that the Alienopteridae are indeed umenocoleoids, and moreover, that by being umenocoleoids these are not stem-group Mantodea. Before we can wrangle with alienopterids' ordinal assignment, concerted effort at synthesizing a comprehensive picture of dictyopteran phylogeny must be made. Well, it is almost 2019, and we are only partway to the imagined dystopias of yesteryear. *An (arguable) model of phylogenetic inference that holds the phylogeny which requires the least amount of ad hoc character state changes is the optimal one, in keeping with Occam's Razor. †Named for "a grant (financial support)" (Vršansky et al., 2018). I applaud the name choice. §Non-parametric bootstrapping is a statistical method first applied to phylogenetics by Felsenstein (1985): it entails simulating datasets (pseudoreplicates) from subsets of the actual dataset, which are sampled with replacement. Confidence in a given node's existence is then expressed as the percentage of pseudoreplicates in which it appears. Hence, the clade that here excludes Vitisma and Liberiblattina was recovered in 90% of all pseudoreplicates (Vršansky et al., 2018). ||An internal node on a phylogeny that cannot be resolved into a dichotomy. Bai, M.; Beutel, R. G.; Zhang, W.; Wang, S.; Hörnig, M.; Gröhn, C.; Yan, E.; Yang, X.; and Wipfler, B. (2018). A new Cretaceous insect with a unique cephalo-thoracic scissor device. Current Biology, 28, 1-6. Bechly, G. (2007). "Blattaria": cockroaches and roachoids. In Martill, D.; Bechly, G.; and Loveridge, R. (eds. ): The Crato Fossil Beds of Brazil: Window into an Ancient World. Cambridge: Cambridge University Press. Béthoux, O. (2007). Cladotypic taxonomy applied: titanopterans are orthopterans. Arthropod Systematics & Phylogeny, 65, 135–156. Béthoux, O. and Wieland, F. (2009). Evidence for Carboniferous origin of the order Mantodea (Insecta: Dictyoptera) gained from forewing morphology. Felsenstein, J. (1985). 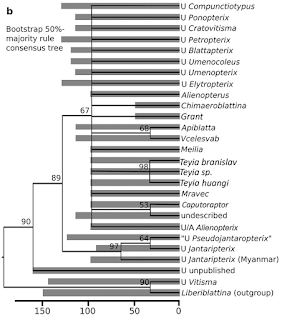 Confidence limits on phylogenies: an approach using the bootstrap. Evolution, 39, 783-791. Huson, D. H. (1998). SplitsTree: analyzing and visualizing evolutionary data. Bioinformatics, 14(1), 68-73. Inward, D.; Beccaloni, G.; and Eggleton, P. (2007). Death of an order: a comprehensive molecular phylogenetic study confirms that termites are eusocial cockroaches. Biological Letters, 3(3): 331–5. Klass, K.-D. and Meier, R. (2006). A phylogenetic analysis of Dictyoptera (Insecta) based on morphological characters. Entomologische Abhandlungen, 63(1-2), 3-50. Nel, A.; Prokop, J.; Grandcolas, P.; Garrouste, R.; Lapeyrie, J.; Legendre, F.; Anisyutkin, L. N.; and Kirejtshuk, A. G. (2014). The beetle-like Palaeozoic and Mesozoic roachoids of the so-called "umenocoleoid" lineage (Dictyoptera: Ponopterixidae fam. nov.). Comptes Rendus Palevol, 13(7), 545-554. Poinar, G. Jr. and Brown, A. E. (2017). An exotic insect Aethiocarenus burmanicus (Aethiocarenodea ord. nov., Aethiocarenidae fam. 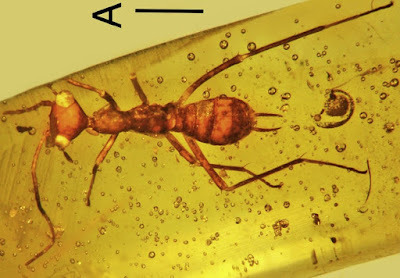 nov.) from mid-Cretaceous Myanmar amber. Cretaceous Research, 72, 100-104. Lee, S.-W. (2016). Taxonomic diversity of cockroach assemblages (Blattaria, Insecta) of the Aptian Crato Formation (Cretaceous, NE Brazil). Geologica Carpathica, 67(5), 433-450. Topper, T. P.; Strotz, L. C.; Holmer, L. E.; Zhang, Z. F.; Tait, N. N.; and Caron, J. B. (2015). Competition and mimicry: the curious case of chaetae in brachiopods from the middle Cambrian Burgess Shale. BMC Evolutionary Biology, 15, 42. Vršansky, P.; Vishniakova, V. N.; and Rasnitsyn, A. P. (2002). Order Blattida Latreille, 1810. The cockroaches (= Blattodea Brunner von Wattenvil, 1882). In Rasnitsyn, A. P. and Quicke, D. L. J. (eds.) (pp. 263-270): History of Insects. Dordrecht: Kluwer Academic Publishers. Vršansky, P.; Bechly, G.; Zhang, Q.; Jarzembowski, E. A.; Mlynsky, T.; Šmídová, L.; Barna, P.; Kúdela, M.; Aristov, D.; Bigalk, S.; Krogmann, L.; Li, L.; Zhang, Q.; Zhang, H.; Ellenberger, S.; Müller, P.; Gröhn, C.; Xia, F.; Ueda, K.; Vďačny, P.; Valaška, D.; Vršanská, L.; and Wang, B. (2018). Batesian insect-insect mimicry-related explosive radiation of ancient alienopterid cockroaches. Biologia, 73(10), 987-1006.